The SAT is one of two standardized college admissions tests used in the U.S. – the other being the ACT. It is intended to demonstrate college readiness based on key skills like reading comprehension and analysis, computational ability, clarity of expression, and problem solving. The College Board, the non-profit group that designs and publishes the test, has conducted a series of validity studies demonstrating a correlation between higher SAT scores and higher first-year college GPAs, which suggests that SAT performance may indeed indicate college readiness. Other studies have indicated that evaluating scores in conjunction with high school grades offer a stronger indication of college success. In the 19th century, admission to the nation’s top universities was far from standardized. Requirements, exams, and application processes differed widely from college to college. In 1900, presidents from 12 leading universities formed the College Entrance Examination Board, hoping to establish a universal way to determine whether an applicant was prepared for college. Thus was born the first standardized college admissions test: In 1901, these 12 colleges administered the College Boards to evaluate applicants’ college readiness. Over the decades, the College Board experimented with different structures. They removed math, then added it back, then removed it, then added it back again; analogies were removed and replaced; vocabulary has been tested in different ways; and time limits and test length have grown and shrunk. Despite these many changes, the SAT has survived for nearly 100 years. Nearly 2 million college-bound high school students take the SAT each year, and although there is a growing number of test optional colleges, most top tier colleges and universities require the SAT or ACT for admission. We recommend that most students first take the SAT by spring of junior year. This ensures that students will have addressed most of the test material in their courses and that they still have plenty of time for additional test prep and future test dates before they need to finalize their scores for college applications. 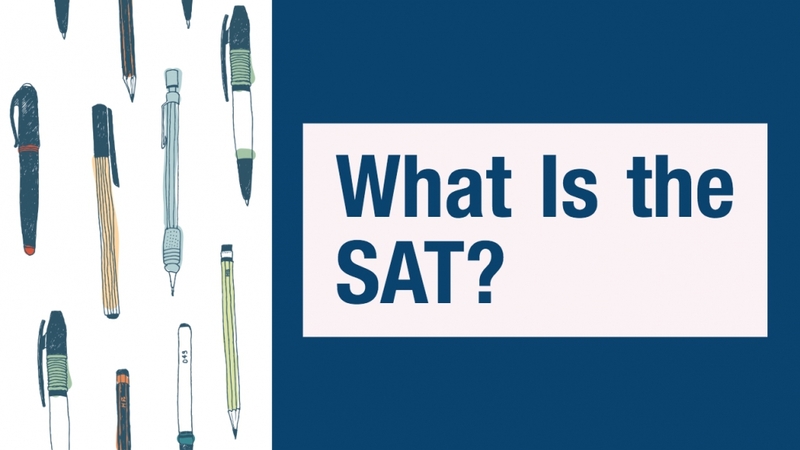 The SAT is offered nationally every year in August, October, November, December, March, May, and June. Review all of this school year’s SAT test dates and registration deadlines. In the chart below, you can see a thorough breakdown of the SAT. Understanding the details of the different SAT test sections is an essential piece of any SAT prep program. There are two math sections: a 25-minute no-calculator section that includes 15 multiple choice questions and 5 grid-in questions, and a 55-minute section that includes 30 multiple choice questions and 8 grid-in questions and allows the use of a calculator. The reading section includes 52 multiple choice questions to be answered in 65 minutes. The questions are based on four passages and one set of paired passages, and at least one passage will be accompanied by a graphic like a chart, table, or graph. The writing section includes 44 multiple choice questions to be answered in 35 minutes. The questions are based on four passages, and at least one passage will be accompanied by a graphic like a chart, table, or graph. The essay is optional, but we strongly advise students to take it anyway. The essay section allows 50 minutes to read a passage and write an essay analyzing the persuasive elements in the passage. The 700 to 750 word passage is a persuasive piece on the arts or sciences or on civic, cultural, or political life. To score an SAT, we first start by calculating the raw score for each section. Each correct answer gets one point, and each blank or incorrect answer gets zero points. There is no penalty for an incorrect answer. In order to account for varying difficulty levels from test to test, the College Board uses a process called “equating.” The College Board expects more students to get more answers correct on an easier version of the test, which means the College Board anticipates a higher average raw score. To ensure fairness to students who take the test on different dates, the College Board will adjust scaled scores. What’s a Good SAT Score? A “good” score depends on how you define “good.” After all, if your goal is to earn admission to Yale, a “good” score will be significantly higher than it would be if your goal is to earn admission to the University of Connecticut. To determine what a “good” score will be for you, you first need to decide on a handful of potential colleges where you’d like to apply. For each college, you should determine the median scores. The median scores tell us where the middle 50% of previously admitted students scored. If you know what your score is but don’t understand how you got it, you can read out post on Understanding Your SAT Score Report. The University of Chicago made national headlines when it became the first top-ranked national university to drop the SAT or ACT as a requirement. How Do Colleges Use SAT Scores? SAT or ACT scores consistently rank among the most important factors in admissions decisions, just after grades and course rigor. Although some colleges are moving away from admissions tests, the vast majority of selective four-year colleges consider these test scores to be very important in the admissions process. Success on the SAT requires many of the same fundamental skills necessary for success in high school, college, and beyond: the ability to read quickly and efficiently, analytical and critical thought, problem solving, the ability to effectively express ideas, facility with the English language, and the ability to interpret information presented both graphically and textually. These skills take time to properly develop. There is no overnight trick that will teach a student to read thoroughly and quickly. C2 can help you score big with a personalized SAT prep program designed just for you.